I can imagine that kids 5-9 years old (students from kindergarten to grade 4) who do not like history will change their minds after reading this book. Kids who already love history will love this book. 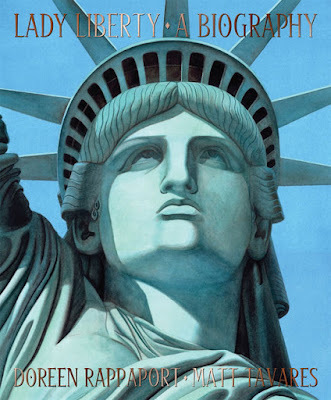 For Lady Liberty: A Biography presents the facts about the Statue of Liberty in a very personalized and very palatable way. 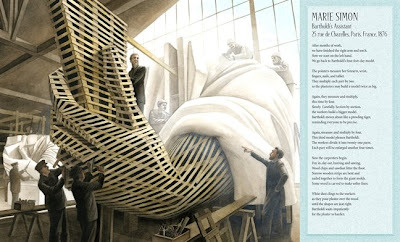 The history of the amazing craftsmanship and touching sacrifices that went into building Lady Liberty is told through the experiences, thoughts, and emotions of (vignettes from) the people involved in her life story. Her sculptor and engineer, her carpenters and laborers. The publisher and the farmers, miners, and factory workers who worked together to raise money for her. The man who first dreamt of her. I was teary-eyed as I read about two boys who sent a dollar that they had saved for circus tickets, a girl who sent her two pet roosters to be sold, and Civil War veterans who sent fifteen hundred dollars - all so that the Lady's pedestal could be built. The illustrations were done in watercolor, ink, and pencil, in a palette of serious tones that compliment the colors and the beauty of the Lady herself. These illustrations are alive. They are so realistic and lifelike that I half expect them to actually move! My favorite illustration is of a ship full of people from many different countries entering the New World, Lady Liberty at the gate to their new lives. One man on deck has his arms reaching out, as if to caress the Lady. He is actually reaching out to caress the hope and freedom she represents. This illustration took hold of my heart and squeezed, none too gently. Lady Liberty: A Biography contains appendices which include notes from the author and illustrator, the dimensions of the Statue of Liberty, a timeline of the important events in her life, and suggested readings for those who want to learn more about her. This is a well-researched book; it is rich with eye-opening and inspiring information. Though I learned A LOT from the book, it makes me want to learn even more about the Statue of Liberty! Lady Liberty: A Biography is a reminder of the beauty of America's freedom and of how immigration is the foundation of America. This enlightening reminder and history lesson is presented in a unique style and format that will draw in young readers.